As you know if you regularly read this blog or follow me on Facebook, Mike and I recently cruised Alaska aboard the Disney Wonder. It departed from Vancouver, and while we were there, I had lunch with a grizzly bear by the name of Grinder. In Ketchikan, I caught an elusive King Salmon. 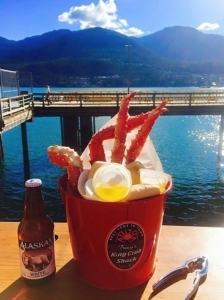 So when we disembarked in Juneau, I wanted to have my picture taken holding a king crab. Well, we never did find a place where I could pose with the king, but we did pass this interesting little building, which I decided to paint. 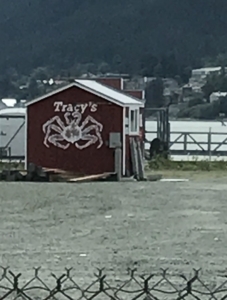 As it turns out, Tracy’s King Crab Shack is something of a Juneau legend. And it all started out as a joke. Ten years later, the company Tracy was working for went bankrupt and she decided to take a stab at her dream. But she didn’t go crabcart. She opened a crab house restaurant instead. 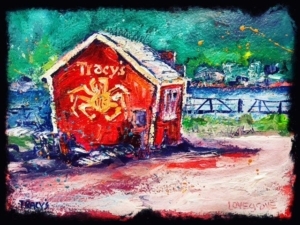 Twelve years later, Tracy’s King Crab Shack is a Juneau landmark and has won numerous Symphony of Food, Certificates of Excellence and other awards and has been written up in Food & Wine, Top Chef, and the New York Times. Tracy’s advertising says they have the best legs in town, and that’s reflected by their logo. Unfortunately, we didn’t get there to sample them, so darn, I guess we’ll just have to go back. But I do have this painting as a keepsake, so the adventure wasn’t a total loss. Lol.